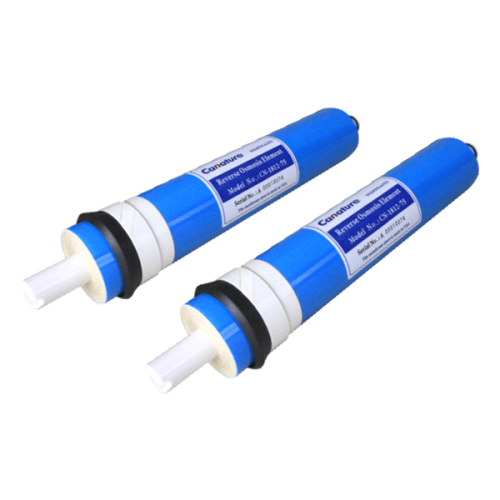 This residential RO membrane elements have the characteristics of reliable, consistent and strong anti-pollution and highest quality and suitable for household water purifier, commercial water purifier and hospital and laboratory water purification device. High quality raw material control, imported membrane sheet, filter screen, glue and Y-ring, all NSF certificated. All testing meet NSF 58 requirements. The maximum effective membrane sheet area bring high flow rate. High salt rejection stability ≥96% at high TDS input. Dry membrane for longtime storage. 100% vacuum testing to ensure any leakage before delivery. Production environment is dust-free and with constant temperature and humidity. Membranes are rolled by automatic and half automatic machines, more tighten and perform filtration effect evenly.